Is Eating Grass Bad for Cats? Cats eat grass to help nature along. Your cat-gal is a little girl of instinct, bred into her over thousands of years. One of these old, instinctive cat behaviors includes eating grass. You may already know what’s going to happen afterward, so keep cleaning materials handy for the inevitable upchuck event. Grass is loaded with nutrients that your little gal might not get in her daily diet. Young grasses contain niacin. It is also high in fiber, trace minerals, moisture and chlorophyll -- a natural antibiotic. Because your cat-gal is such an instinctive creature, she knows what she needs to take care of her health, so when you see her nibbling delicately at grass, don’t stop her. If you don’t want her eating grass from the yard, because it might contain pesticides or herbicides, buy small containers in the pet food aisle at the store, follow the growing instructions and place the sprouted grass next to her food bowl. She’ll take it from there, thank you very much. She may feel the need to bump up her nutrients. She may also eat grass because she likes the taste. Grass that has not been sprayed with chemicals is good for her, so let her eat away. Just keep the cleaning rags and a good carpet cleaner handy, because your little critter and you both know what will happen once she’s eaten a little grass. Another excellent reason for making a safe cat grass available is to keep her from gnawing on your furniture cushions or, heaven forbid, electrical wiring or cabling for your electronics. If your little cat-gal is an outdoor lover, she stalks and kills prey, such as birds and lizards. Unlike her humans, she doesn’t bother separating the flesh from the bones or feathers -- she simply scarfs the entire thing down. Once she’s done, she’s dealing with what feels like a rock in her little tummy, so she does what’s best for her. She goes outside and eats grass, waits a little while, then those bones and feathers come up and out. Lovely. Hopefully, she’s outside when this happens. The grass blades wrap around what she’s trying to bring up, which prevents her digestive system from being punctured by a sharp bone. Now, this is lovely because it protects you from an expensive vet bill. Because your cat is so careful of her appearance, she grooms herself. Those loose hairs end up in her tummy or in her bowels. Again, she knows what’s best. A little grass for what’s ailing her will help her bring that nasty hairball up or it will act as a laxative. Remember, your little girl knows what she needs. The grass helps her to eliminate a hairball that has moved into her bowels. and, once she’s passed it, you’ll have a much happier baby. Don’t stop her from doing what she knows is best for her. Buy a grass kit and grow it according to the package instructions. By giving her access to a tasty green, even despite the aftereffects, you’re keeping her from turning her curiosity and teeth to your potentially poisonous houseplants. Cleaning up a little cat yak (sorry!) from eating grass is much preferable to rushing her to the vet after she’s snacked on a forbidden plant sitting on a high shelf. 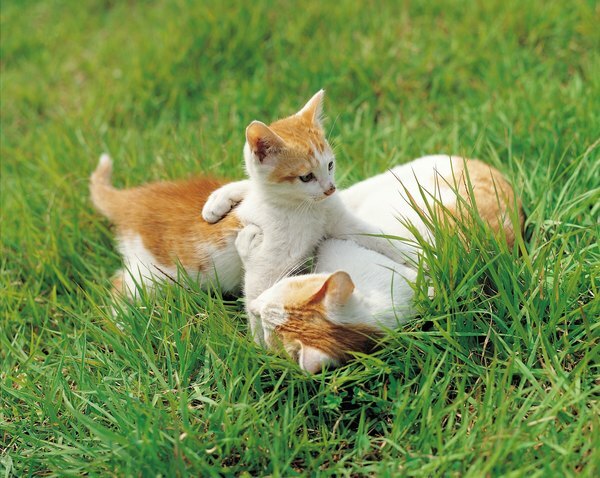 Know Your Cat: Why do Cats Eat Grass? Dave’s Garden: Cat Grass for Cats – Good or Bad? Why Does My Dog Eat Grass & Vomit? What Is the Purpose of Cat Grass? Why Do Dogs Eat Cat Feces? What Type of Grass Do Cats Like to Eat? What Effect Does Grass Have on Cats & Dogs? What Does it Mean When a Cat Eats Grass?